We’ve all got our own quirky tastes and texture preferences, even for simple protein shakes. Here are a few tips you may find useful in preparing your favorite protein shakes. ~ is too thin: Try adding a few ice cubes, frozen fruit, or a tablespoon of sugar-free instant pudding mix to thicken it. ~ is too thick: Some protein mixes have guar gum or other artificial thickeners in them. To use up less-favorable protein powders, you can make shakes using only a half-serving, mixing in a regular whey protein to cover the protein gap. ~ is not creamy enough: Try using a tablespoon of sugar-free pudding mix if you make your shakes with water or milk. If you use milk, you can try using milk with higher fat content (1 or 2% instead of skim). Low-carb dieters or those not concerned with low calorie counts can add some half and half–magic! ~ is not foamy or frothy enough: Extend the whip time in the blender to fluff the shake. ~ won’t dissolve: Solubility is usually related to the the particular brand of protein. Your best option is to first blend your liquid and ice and slowly add the protein to the blender. Look for an “instantized” protein that blends easily to avoid the problem all together. ~ is not sweet enough: Add a packet or two of Splenda or a small piece of banana. Fructose (fruit sugar) is 70% sweeter than sucrose (table sugar); a small piece of banana or other fruit goes a long way in providing sweetness. ~ has weak vanilla flavor: A half-teaspoon of imitation vanilla flavor or quarter-teaspoon vanilla extract will enhance the vanilla flavor without adding calories. Alternatively, you could add a tablespoon of sugar-free instant vanilla pudding. ~ has weak chocolate flavor: A teaspoon of real cocoa powder will give you a nice chocolate flavor without adding the sugar that comes with using chocolate syrup. This is a great idea for those who only purchase one flavor of protein at a time because you can add cocoa to vanilla protein to make rich chocolate shakes. ~ sticks to the blender glass: Always add the liquid to your blender or shaker first. When blending thicker shakes, try pouring the protein into the blender as it whirls or lightly pushing the powder down with a spoon to ensure it mixes. ~ is to go: To cut down on dishes and make a handy to-go shake, you may be able to use a pint or quart Mason jar in place of your blender pitcher. Simply remove the blending attachment from the pitcher; if it twists onto the jar (like a jar cap), it will work. Put your drink ingredients into the jar, twist on the blending assembly, turn the jar top-down onto the blender and hit the switch. Voila! 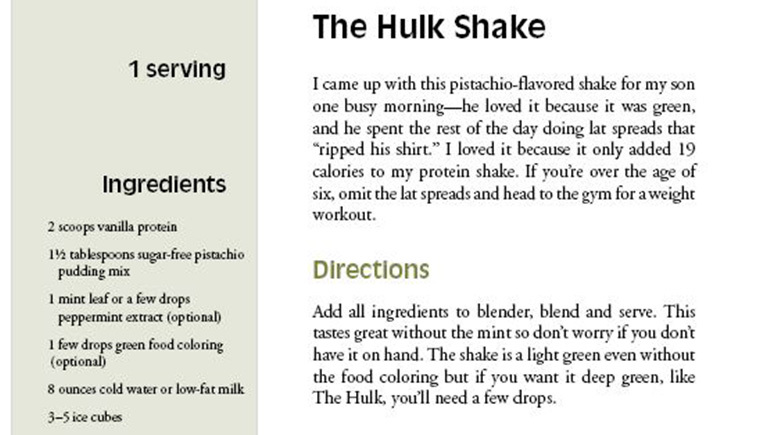 Here’s the full 8-page protein shake excerpt PDF. Click here to review the recipe list, get a sampler pdf or order Stella’s Kitchen.